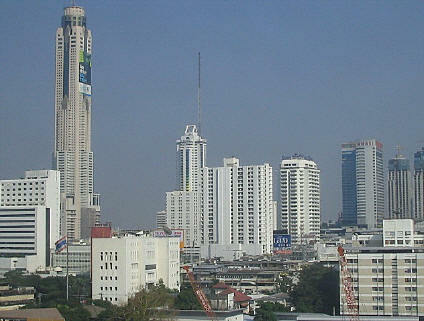 The first thing you'll notice about Bangkok is that it is nothing like the guidebooks. I guess they figure that people going on a holiday in a far-off country don't want to flip through a book and see a picture of a large paralyzing traffic jam. Maybe it would remind them too much of home. 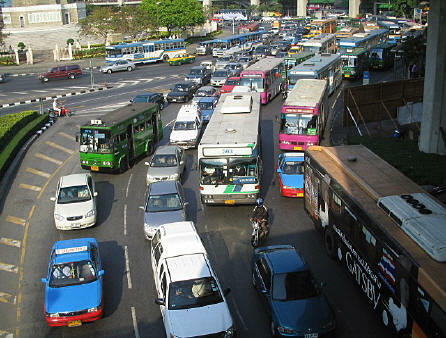 It is not like the folks in Bangkok are not working hard to solve their traffic problems. They are. They have a wonderful elevated train system that is now five years old. This Skytrain system, although short, has addressed the critical problem of connecting the large expensive tourist hotels to the overpriced mega shopping malls. First things first. 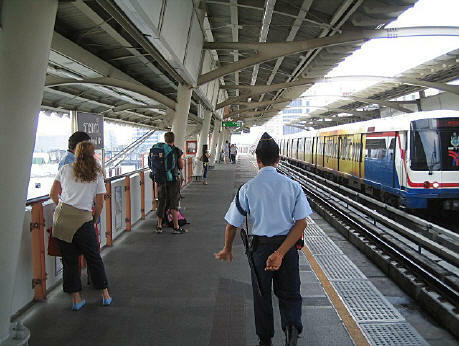 Bangkok also has a brand new subway system, the MRT, a lone line five months old. I rode it and found it to be just like the Skytrain, but with zero view. I'm told this is state of the art. The day after I rode it, they had their first crash, with one hundred injured people. The whole system has been closed since. I wondered if I should have told them I was coming. I bought a day pass for Skytrain. I wanted to see as much as I could. 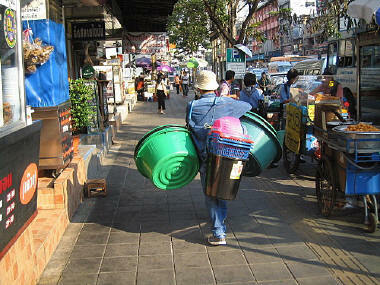 I started to think, OK, suppose I was a Bangkok worker and had a day off. Where would I go that doesn't cost money and is not oriented toward selling me something? The public space. Where is it? This time of year the temperatures are lower and it is dry, but the trade-off is that the air is filthy. If you set off for a walk, the air along the roadways is especially horrible. I found roads and sidewalks to be worn, soiled, crowded, and in a state of advanced decay. Maybe there's a nice park somewhere. I saw one marvelous sanctuary of trees, flowers, grass, and greenery but it wasn't open to the public. It was something for the royal family. Behind the tall walls, it looked empty. I did find another green open space but that one was for the Thai military. It had a sports field and track. I asked a woman at a shop, "Where do you go on your day off?" "Stay at home," she answered. I spent time asking people questions, and this is the picture I drew. The average worker gets paid about 7,000 Baht a month for working six days a week (that's about $175 a month). Housing is miserably cramped. Workers take crowded, overloaded buses to work and back. Employers can get around paying their workers so much by hiring immigrants from Laos, Cambodia, and Myanmar (formerly, Burma) who don't have legal residence. They can pay these workers 4,000 baht a month or even less. The workers are afraid to ever voice a complaint (the Thai rendition of “don't ask, don't tell”). 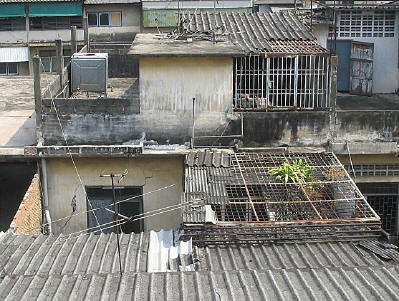 The other side of the coin (if you have a coin) is the spaces for those with money in their pockets. If the sidewalks and streets are hot, crowed, noisy, and polluted, then there are spotless shopping centers with restaurants, bars, designer brands, Internet access, and many, many other things nestled in clean, new, air-conditioned tranquility. 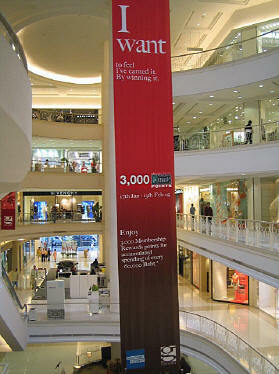 I don't need to say much about these because, funny, they have many of the same stores you'd find in malls in America. If that's what you want, you needn't go anywhere. Meanwhile back in Bangkok, what I started to notice (anyone who's been here will tell you the same thing), it’s rather amazing how — under such difficult conditions, with so little to work with, in such crowded conditions, in the rotten air, and in this mega city — it’s amazing how incredibly gentle, kind, hard working, patient, and resourceful the Thai people are. It’s amazing what close relationships they have with others and how much they like to have fun. My advice would be to try to spend your money with the Thai people themselves as often as you can. That way the money will not go to the multi-national outfits that will just ship it back across the sea. It will go where it's most needed and deserved. Don't worry about traffic or bad air here in Bangkok. What is lost because of it is more than regained by the sweetness of the people and the richness of their culture. And, yes, there are many tourist sites to see. Wats, temples, palaces, and museums, to name just a few. I asked a woman where I was buying a soft drink if she had ever gone to one of the Bangkok museums. "No, never go. No have time. Have work every day. No time to go museum."